While some subdivision of the pits between sub-periods 3A and 3B could be attempted (Figure 97), the lack of chronological definition displayed by the limited number of other features present makes this fairly meaningless. Instead, broad Period 3 activity is described collectively within OA28. The Period 2B Buildings 5 and 30 are judged to be cleared by the late 1st century and the system of sub-enclosure across the rear of the plot is also abandoned. Both buildings and sub-enclosures are replaced, though otherwise the character of land-use within OA26 remains similar to that of the preceding period. Structural remains in the form of slots and post-holes provide evidence for a building situated toward the north-western corner of OA26. However, the reconstruction of the building plan is speculative and incomplete (Figure 98). Although the details of the building are far from certain, the concentration of structural features strongly suggests that a building of some sort occupies this part of the enclosure. One possible reconstruction incorporates a central aisle or corridor demarcated by slots with a post-built room on either side. The size of the post-holes varies, and the building reconstruction conspicuously lacks all its corners. This reconstruction defines a 6m long (7.5m with porch) corridor, aligned on the site's major NNW-SSE axis, with a room on the east of internal dimensions 5.2m by anywhere from 5m to 9m, though an east wall could be defined by slot 24211. Building 40, as posited, overlies Period 2 roundhouse Building 5 and may be a direct replacement of it. The intrinsic dating evidence from the building is poor, although a date in the second half of the 1st century AD is probable. Pits (Group 692) which later encroach into the footprint of the western room and the corridor date to the late 1st or early 2nd century AD. 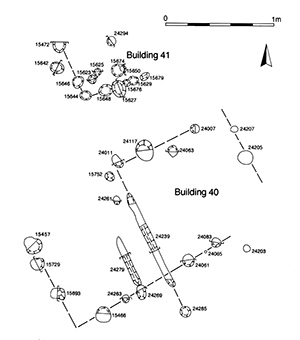 Another tentatively construed post-built Building 41 is located some 3.5m to the north of Building 40, and is similarly aligned. As reconstructed, it cannot be much bigger than 3m by 3m (Figure 98). One possibility is that it represents a northwards projection of Building 40 (or at least, its east side), but the posts are much more closely set than for Building 40, and it seems more likely to be an out-building of some sort. No function is apparent, but similarly-proportioned close-set posts for such a small building seem often to be interpreted as supporting raised floors for granaries (e.g. Danebury: Cunliffe and Poole 1991). Hearth 15465 may be an internal feature within the western room of Building 40, although its position so close to its north wall perhaps makes this doubtful. The shallow sub-circular cut contained scorched yellow-orange clay and fire-reddened stones. The hearth may have an entirely domestic in function, but post-hole 15466 at its posited south-western corner contains several pieces of iron strip, slag and hammerscale, which could provide some evidence for metalworking being conducted here. 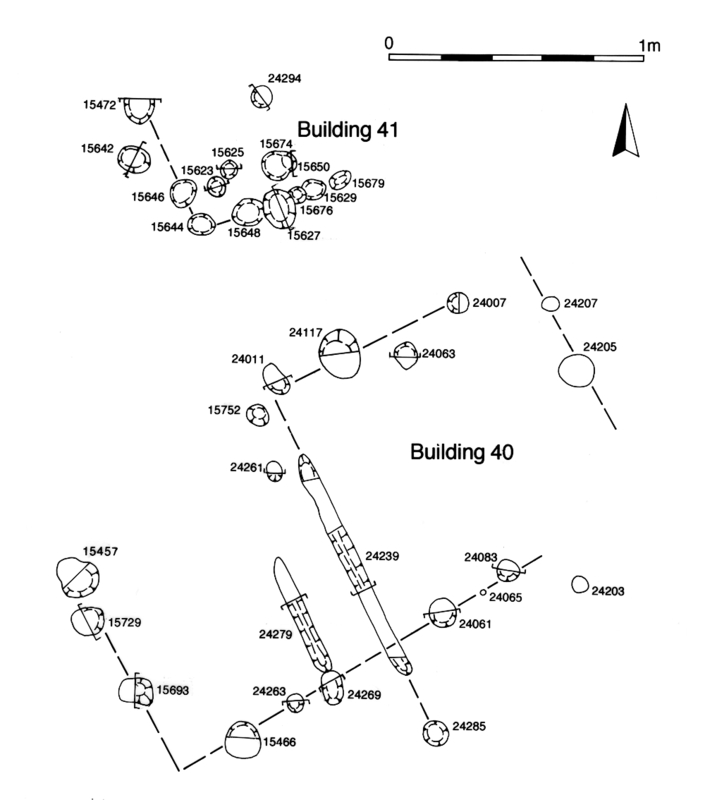 The area to the south of Building 40 is occupied by a number of narrow slots, all similar in size and alignment and orientated orthogonally to the building (Structure 29 Group 687, Structure 31 Group 682, Structure 32 Group 683). These seem to define a new system of fences, imposed in the late 1st century AD, which subdivide the rear (southern) half of OA26. 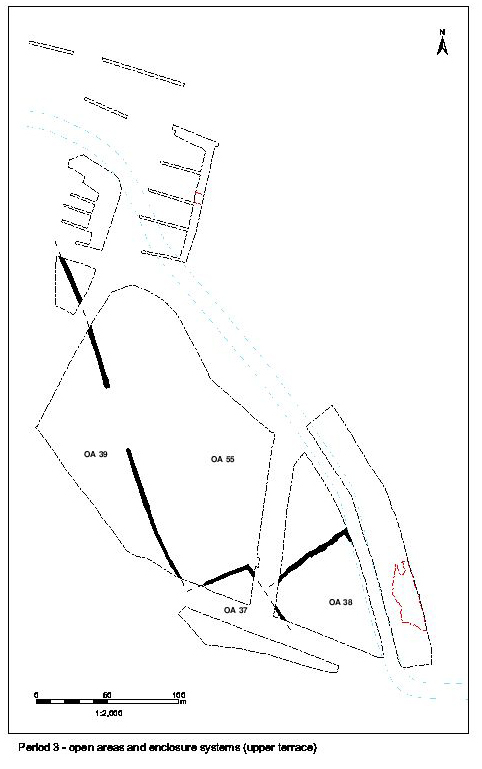 The new subdivisions replace those of Period 2B (Group 229), perhaps reflecting changing use across the rear of the enclosure or at least its reorganisation. The westernmost of the fence structures comprises three shallow slots 25084, 25085 and 25086 (Group 687). 25084 and 25085 are parallel features running on an ENE-WSW alignment, some 2m apart. Though their eastwards extents are not determined, owing to truncation by later pitting, both have rounded terminals to the west and are of similar proportions, averaging 0.3m wide and 0.10-0.15m deep. Slot 25086 and parallel slot 25165 (Group 685) run at right-angles to these, some 15m apart from one another. Collectively, these foundation slots seem to mark three sides of a smaller sub-enclosure, such as an animal pen, occupying at least part of the south-west corner of OA26. Its southern extent is not established. 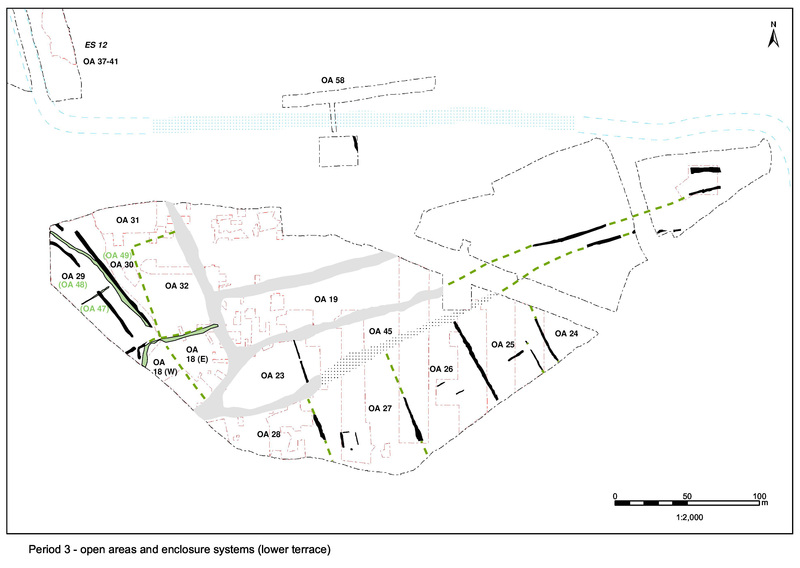 However, it is noticeable that the alignment of these NNW-SSE slots is slightly different to that of the western enclosure boundary ditch (Group 146 Period 2B) - seemingly being laid out, along with Structures 31 and 32, with reference to the eastern boundary instead. The fills of the slots contain few finds, the majority of the pottery being of undiagnostic Roman date, though that from 24249 is early Roman and 24217 contains a single sherd of late shell-tempered ware, presumed to be intrusive among otherwise probably early Roman pot. It is therefore likely that these slots date to the later 1st century AD. This arrangement may not last long, as Structure 48 (ditch 25087, Group 473) cuts through 25086, probably some time in Period 4 but perhaps conceivably earlier. Further slots (Groups 685, 682, 683, 684), of similar size and alignment as Structure 29, lie across the eastern part of the rear of OA26. Although apparent terminals to many of these features are excavated, pre-excavation plans suggest their continuation further east and west. It is particularly evident that Structure 32 (Group 683) replaces the Period 2B subdivision defined by Group 229. It is also conspicuous that the subdivisions are broadly orthogonal to the eastern side of Open Area 26 and do not respect the alignment of its western boundary (Groups 146, 147). The pottery from the fills of these features is consistently late 1st century AD in character, though occasional intrusive sherds are evident. The parallel east-west slots of Structure 31 and Structure 32 are evenly spaced, some 11m apart. The spacing of the north-south aligned elements seems slightly less regular. Just to the east of 11415 (Group 683) an unexcavated slot runs parallel to 23385 (Group 687) at a distance of just under 22m. However, the distance between 23385 and Group 685 is only c. 15.6m. Notwithstanding these variations, it seems apparent that a fairly regular, orthogonal system of subdivision (units of approx. 22m x 11m) is applied to the southern part of Open Area 26. While these may demarcate individual cultivation beds within a garden plot, the small size of the eastern examples may rather suggest functions such as livestock pens. The majority of these pits, in contrast to those of Period 2B, are relatively small and circular to oval in plan, generally between 1.0 to 2.3m wide. Depths vary, from under 0.2m to 0.9m, but most are around 0.4-0.5m deep. The exceptions in terms of size are 15773 and possibly truncated pit 24188 which are as much as 5.0m wide. The artefact assemblages in these pits, whether large or small, are similar - although both metalwork and animal bone may be a little more prevalent - and these indicate similar patterns of activity to those seen earlier. Even pit 15773 contains relatively few finds compared to its large size. 15993 is a re-cut of pit 15641 (Group 240 Period 2B). Nearly all have some residual LIA pottery too. None is dated later than early to mid-2nd century. Pit 15902 (Group 899) lies within the Building 40 footprint, though their relationship is not apparent. This pit contains an Aucissa brooch (SF6425). Pits 15917, 15922, 24013, 24121 (Group 692) apparently post-date, and therefore mark the abandonment of, Building 40. Pits 15757, 15918, 24075 (Group 900) have a less clear relationship with the building and may either lie within or post-date it, though some are cut by Group 692 pits. Some (e.g. 15917) are datable to the mid/later 2nd century and provide a date by which Building 40 was out of use. Pit 24312 (Group 690) is of similar later 2nd century AD date (AD 160-200). The artefact assemblages from these pits are generally homogeneous and similar to Period 2. This may demonstrate a continuity in patterns of activity to those seen earlier, though with much demonstrably residual pottery present some caution must be exercised. However, animal bone, and stone and ceramic building materials seem to be a little more common and metalwork may also be more prevalent than in earlier pits (excluding the Group 239 Period 2B 'industrial' pits). 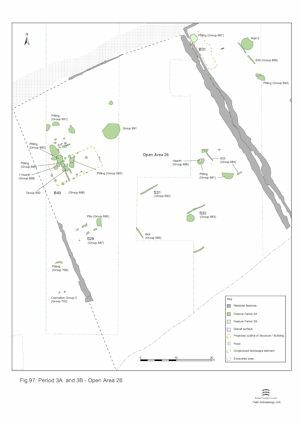 Pits 15573, 15687, 15744, 15773, 15880, 15993, 24130, 24242, 24303 (Group 691), to the north of Building 40, seemingly respect its location and may be contemporary with its use, but the dating evidence is far from clear. Pit 15773 contains KPG19, an assemblage that is dated to c. AD80-100. Pit 15573 is of note as it contains a range of iron artefacts including 'shackles' (SF6670), ring (SF6673), chisel (SF6668) and various nails, along with animal bone and over 2.3kg of tile. In addition, and perhaps most significant of all, the findspot of iron bloom SF2676 found during machine removal of the topsoil, directly overlies this feature and almost certainly derives from it. At a weight of 12.25kg, and bun-shaped, it is potentially the largest Roman bloom found in Britain. 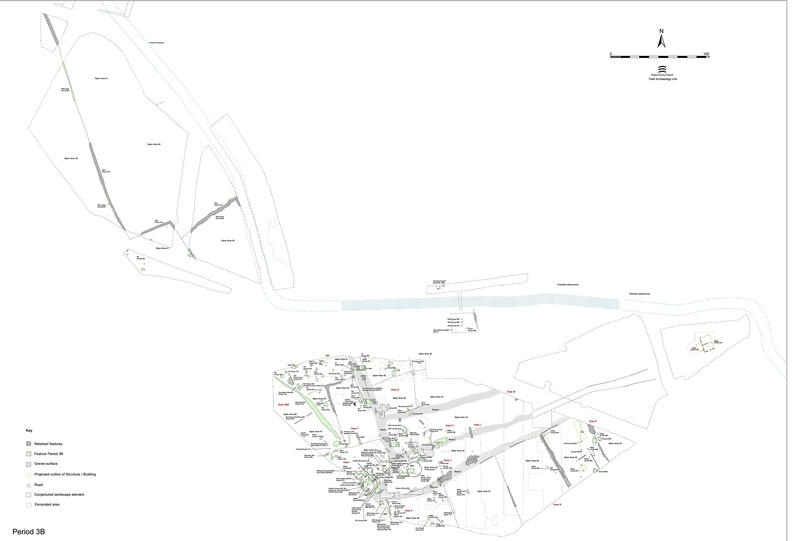 This provides further evidence that metalworking may take place within Building 40, or at least within OA26 generally, during the early Roman period. While 15573 could simply be a rubbish pit, its small size and high metalwork content could together suggest a placed deposit. Its size and positioning within OA26 is not similar to those of 4148 in OA28 or 20008 in OA27. 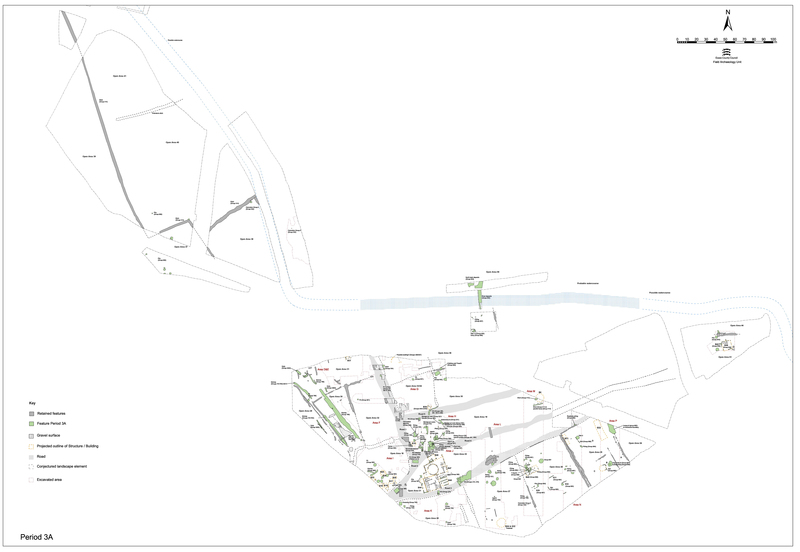 Alternatively, its sub-square shape and location is also strongly reminiscent of the Period 2 Group 239 pits (15289) that all contained quantities of metalworking waste. 15573 could therefore represent a continuation of this activity into Period 3. The BSM bracelet (SF7453) in pit 15744 (but possibly later/intrusive) is notable. Pit 24312 (Group 690) pre-dates Structure 29. 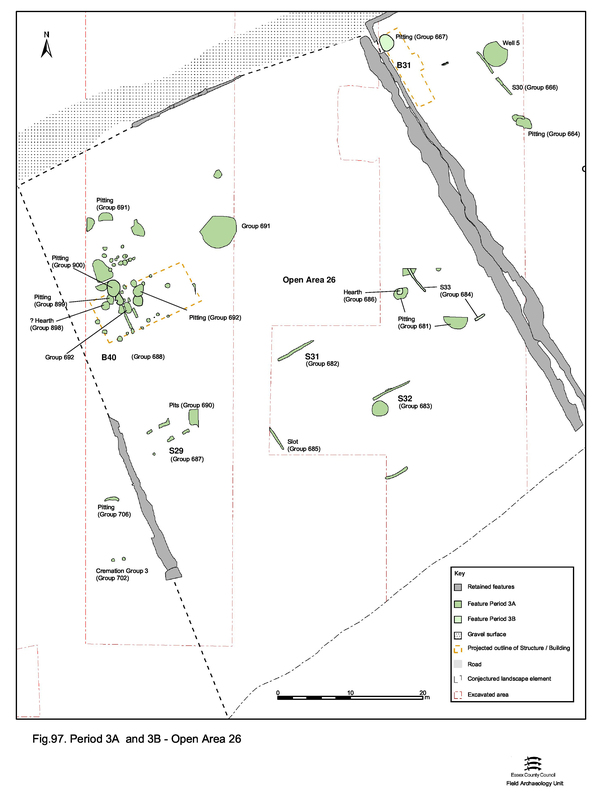 Pits 11533, 23032, 23140, 23391, 23395 (Group 681), on the eastern side of OA26, share much the same distribution pattern as the Period 2 pits in the same vicinity. Most of these pits are large, often over 3m diameter, but their depths do not exceed 0.54m. All contain mid-1st to early 2nd century pottery. Pit 23140 includes samian of AD 70-110 and that from pit 23032 is AD 100-120. Finds assemblages are not particularly different from those of earlier pits, with baked clay present in some quantity. However, oyster shell, glass, worked stone, brick and tile are also now evident. Evidence of metalworking is infrequent. Pits 11599, 23024, 23118 (Group 983) may date to the latest part of Period 3. Hearth 23157 survives as an oval concentration of burnt flint cobbles, lava quern, daub and tile fragments (23008) set into the top of pit 23032 (Group 681). In its constituents, and its positioning in the top of a recent pit fill, it is very similar to the hearths of Period 2B. While no distinct function can be assigned to this feature, the presence of such a hearth-type feature does suggest similar patterns of activity continuing from Period 2B into 3 in this vicinity.